“We should do a better job embracing and celebrating go’s status as the deepest, most challenging competitive game in the world, deeper than chess, harder than poker,” said New York University Game Center Director Frank Lantz in the keynote speech last Saturday night opening the 2014 US Go Congress in New York City. 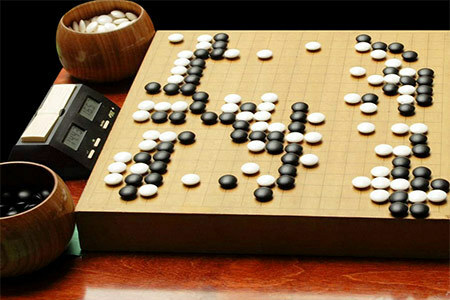 In a riveting 45-minute multimedia presentation on ‘Go in the New Age,’ Lantz urged hundreds of assembled go players to challenge their own assumptions about how to popularize the game. A self-described “terrible amateur despite a lifetime of off-and-on study,” Lantz described go as “a beautiful work of vibrant culture” and in a tour de force performance that melded history, art and culture, insisted that despite being more than 4,000 years old, go is not an ancient antique, “It’s alive here and now,” he said excitedly. Go, he suggested, should not be content to be a game of interest only those intrigued by the arcane. “There is a huge online audience of game players who play games that require study and intelligence, not just fast fingers,” he said, describing how video, multiplayer and other e-games have huge audiences worldwide. He urged the US go community to develop a significant, interesting go presence on Twitch, “where there are millions of these people” and suggested marketing go to this audience with the theme “Go is the most difficult strategic game ever invented.” We should “worry less about the beauty and age of go in marketing it,” Lantz said, and emphasize the game’s difficulty and challenge. Stars and a global rating system are important too, Lantz said. “It should be as easy to follow top go players as it is to follow an NBA team. Who’s the best player in the world? That gives other players – especially young ones – someone to follow and to emulate.” Tournaments also should be easier to follow, he added. “What’s a ‘jubango’” he asked, noting that Gu Li and Lee Sedol, two of the top players in the world, are currently competing in a one-on-one showdown that no-one outside the go world – and arguable many inside – don’t really understand and therefore find it hard to follow. “We should be a little less Tang Dynasty and a little more NASCAR,” Lantz argued. The speech garnered an enthusiastic response and Lantz’ analysis and suggestions have doubtless been a topic of discussion at this week’s Go Teacher’s Conference at the Go Congress. Lantz became known to the go community because of his lecture ‘Go, Poker and the Sublime’ at the at the 2011 Game Developers Conference (Life and Death and Middle Pair: Go, Poker and the Sublime 10/30/2012 EJ).